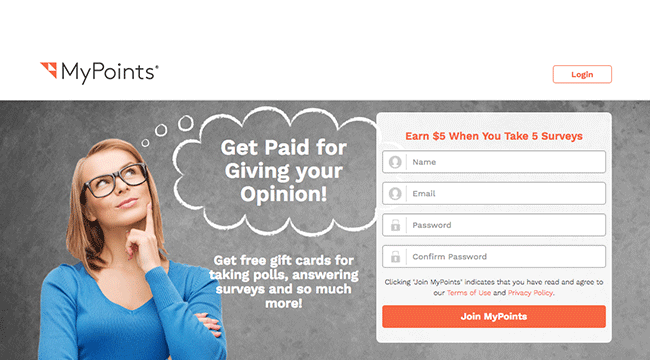 MyPoints Survey is one of many reward websites that people can use to earn rewards. If you are interested in it, the following MyPoints Survey review will describe the website in greater detail. We will take a look at how it works and address concerns on whether or not the site is legit. Alongside that, the MyPoints Survey review will also focus on some common concerns that users have about the website and its program. These include worries about a lack of customer support as well as missing points. Disclaimer – MyPoints Survey is currently undergoing maintenance. This article is a review of the website as it was when last online. 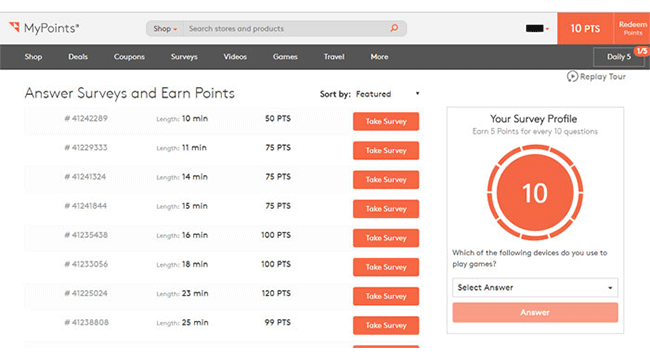 MyPoints Survey is an online rewards program similar to sites like SwagBucks in that you have to perform various tasks to earn points. These points can then be used to collect different rewards, the likes of which will be discussed later on in this MyPoints Survey review. There is no shortage of tasks to complete to gain these points. Is MyPoints Survey Legit or a Scam? A vital question to answer in this MyPoints Survey review is if the website is a scam or if it is actually legit? Well, all evidence points to the website being what it claims to be. There is no startup fee, and they do reward you for your time in points that can be transferred into other things. On the other hand, although it is legit, there seems to have been an increase in the number of complaints over the years about the company because of its lack of communication and sometimes missing points. It may be legit, but there are some that have reservations about the site in its current form. Surveys: One of the main focuses on MyPoints Survey are the surveys. You can take those that you qualify for to earn points. Videos: Another way to earn points is by watching videos, and there are numerous such categories to choose from. Shop: If you shop through select stores via the MyPoints Survey website, then tracking information is sent back to MyPoints that indicate if you’ve made a purchase. From there, you will be rewarded in points. Still, these can take anywhere from 2-30 days to show up in your account. Games: You can play online games from the MyPoints website to earn points in addition to getting a chance to win cash prizes from the games themselves. Travel: You can rack up points by comparing travel websites. Mobile app: You can earn points on-the-go by downloading the mobile app and watching videos. MyGiftCards Plus: Through this program, you can earn points by purchasing gift cards. Deals: There are a number of deals offered that you can take advantage of and earn points. Refer a friend: You can refer people to the website to earn points. Search and earn: Search the web through the MyPoints Survey website to gather up some additional points. Gift Cards: You can transform your points into either physical gift cards or eGift cards. Travel Miles: If you have a United MileagePlus account, you can redeem your points for travel miles. Cash: Your points can be transferred into cash if you aren’t interested in the other rewards. This can be sent to either a PayPal account or to your Visa prepaid card. Variety of tasks: MyPoints Survey offers you a great number and very varied tasks to complete to earn points. This can be useful as things won’t get too repetitive for users. Different rewards: Rather than just cash or just gift cards, you can choose from three different rewards after earning enough points. Difficulty with points: Many users have recently reported having issues with points showing up after completing tasks. Hard to get accepted for surveys: Likewise with other similar websites, it can be difficult getting qualified for surveys. Some users mention spending 10 minutes on a survey, only to be kicked out at the end and not earning any points. When searching for user opinions for this MyPoints Survey review, we found out that one of the most common complaints was trouble getting in touch with the customer support. Some users reported getting automated responses rather than any actual answer to their questions. Others mention that their accounts were deactivated without any prior notice. This connects to another concern about points not showing up. Those who access their account and see they haven’t earned the points expected after successfully completing tasks try to contact the support team, and many claim that received no help at all. There is little you can do yourself to fix this other than try to contact them in different ways, for example, through social media outlets. Official website: You can submit a request through their official website, and you can choose your topic from the dropdown menu. Social media: MyPoints Survey has a Facebook account you can try contacting them on. App: You can download the Daily Scoop app from the Google Play Store or the App Store. MyPoints Survey is an opportunity for you to earn a little extra income on the side, but the likelihood of it growing into a permanent job is slim. You can earn points from a decent number of different tasks though, and they can be redeemed for cash, gift cards, or travel miles. Sometimes, getting in touch with support if anything goes wrong can be difficult. After reading the above MyPoints Survey review, are you interested in the website? Let us know in the comments. Not particularly happy with MyPoints Survey or would simply like to try out other similar websites? Check out the following and take your pick!